Paul, the v8 6.00 liter badge illustration doesn't seem right, if the numbers are correct, the badge will be below the side molding. Is it 60mm from bottom of fender or 60mm from side molding? Also, could please PM me pricing of a set of side indicators and a set of fog housing shipped to US? Thanks! l77 wrote: Paul, the v8 6.00 liter badge illustration doesn't seem right, if the numbers are correct, the badge will be below the side molding. 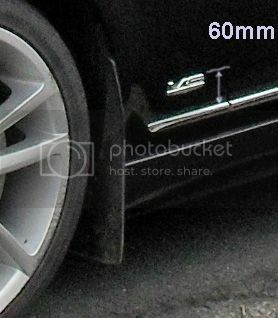 The V8 emblem is approximately 30mm high, the chrome strip is approximately 25mm high. The only way 60mm can work is for that measurement to be from the top of the badge to the top of the chrome strip.